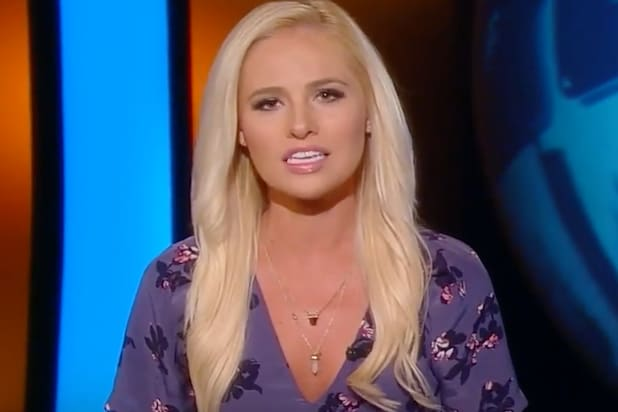 Tomi Lahren has added her voice to the Roseanne Barr implosion, pointedly distancing herself from the former ABC star. With the quasi-exception of Harris Faulkner, Lahren comments broadly reflected the editorial position of the network’s opinion hosts, which declined to defend Roseanne for joking that former Obama aide Valerie Jarrett was the child of apes and the Muslim Brother hood. Sean Hannity called the comments “outrageous” on his radio show Tuesday and said Barr had been right to apologize. Lahren’s response suggests that any potential conservative backlash to axing Barr won’t be championed by the movement’s thought leaders, and will remain confined to the murkier corners of Twitter and Reddit. Despite a fulsome apology Tuesday evening, in which Barr said her tweet was motivated by Ambien, network honchos canceled her show mere hours after she dispatched her social media communique. “Roseanne’s Twitter statement is abhorrent, repugnant and inconsistent with our values, and we have decided to cancel her show,” said ABC Entertainment chief Channing Dungey in a terse statement Tuesday announcing the move.